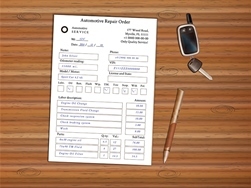 Keep a Repair Log on Your New Vehicle—Just in Case | The Consumer Law Group, P.C. The last thing on your mind when you drove your new car home was what could go wrong with it. After all, you invested in a new car so you would know it was in perfect shape and you wouldn’t have to worry about repairs for a long time. However, if you have unknowingly purchased a “lemon”—a new car with manufacturing defects that affect its safety or performance—you will unfortunately be facing multiple trips to the dealership and you will want to keep track of those visits and repair attempts. In Virginia, a new vehicle may be considered a lemon if you have tried unsuccessfully to have it repaired three or more times for the same problem, or the vehicle has been out of service for more than 30 days in an 18 months period after delivery of the car to the first owner. You must file your claim within 18 months of the date the vehicle was delivered to the first owner and you must provide documentation of the repair attempts. One piece of evidence that will help you pursue a lemon law claim is a detailed repair log. You also must write a letter certified mail or overnight delivery to the manufacturer about your problems with the vehicle after which the manufacturer has 15 days to fix it. What Should Be Included on a Repair Log? If you end up taking the vehicle back to the shop for the same problem more than once, be sure you describe the problem exactly as you did on previous visits. This will help to establish your claim that the car is a lemon. When to Call The Consumer Law Group, P.C. If you are unlucky enough to find yourself with a lemon, you will need to take action. You must inform the manufacturer in writing of the problem you are experiencing and you should contact the Better Business Bureau for resolution. If you are not getting a satisfactory result from these efforts, call our office for an evaluation of your claim.